Incoterms are the official International Chamber of Commerce (ICC) rules for the explanation of trade terms. Incoterms 2010 is adhered to by all major trading nations of the world, and it is the authoritative text for determining how costs and risks are allocated to the parties conducting international transactions. Incoterms facilitate the conduct of international business by defining the responsibilities of the involved participants. Today, we’re discussing the Incoterm EXW, also known as Ex Works. What Does the Ex Works (EXW) Trade Term Mean? When Can EXW Be Used? EXW can be used for all transportation modes. This rule places minimal responsibility on the seller. The seller does not need to load the goods on any collecting vehicle or clear the goods for export (where clearance is applicable). If the seller loads goods, it is at the buyer’s risk. 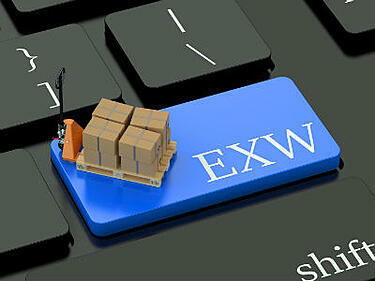 In many cross-border transactions, EXW can present practical difficulties. Specifically, the exporter may still need to be involved in export reporting and clearance processes and cannot realistically leave these to the buyer. Consider Free Carrier (seller’s premises) instead. Ex Works does not require the buyer to export the goods at all, and diversion is a real risk. Imagine a letter of credit issued to beneficiaries in Colorado stating, "Ex Works the seller's warehouse." It’s easy to understand, and exporters often think it’s the least hassle for them because it essentially means the goods are at the back door; come and get them. However, if the exporter has a letter of credit calling for an onboard ocean bill of lading issued from a West Coast port, how will the exporter obtain the bill of lading? What if the merchandise is destroyed en route to the port and they can't get a bill of lading? They've fulfilled their obligation under the Ex Works agreement, but they can't get paid. Where Does Risk Pass in Your International Shipments? Shipping Solutions export software can help you streamline the process of recording which Incoterms version you’re using and make sure your documentation is correct throughout the transaction. You can try it for free today!